Nurse Call Equipment « Global Market Insights, Inc.
Geriatric care, having endorsed itself as a prominent sector in the healthcare space lately, has led to geriatric care services market registering substantial prominence. The industry, having depicted immense potential, is anticipated to emerge as a highly viable vertical in the years ahead. This does not come as a surprise however, considering that the global geriatric populace has been exhibiting a steady rise since the last half a decade, leading to a major upsurge in the prevalence of chronic diseases and a substantial rise in the demand for care services. Taking into account the United Nation Statistics, the global geriatric care population which accounted for 809.4 million in 2012, is likely to rise by more than double by the end of 2050, to an approximate population of 2000 million. This increasing old age population will positively favor the geriatric care services industry landscape over the coming years. Geriatric care service is a specialized segment of healthcare looking after the old age population in terms of their health, needs, living, and their overall quality of life. 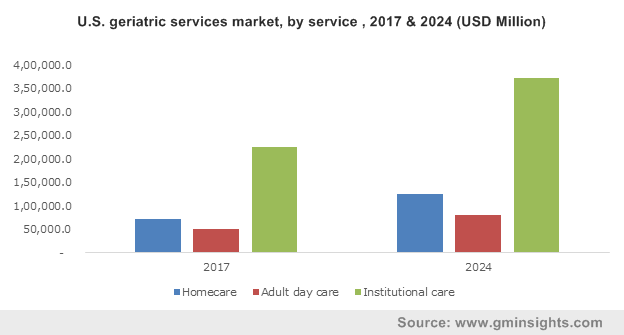 Owing to increasing old age population and growing number of care facilities like home care, day care, and institutional care services across the globe, the geriatric care services market size is quite overtly expected to increase in the coming years. According to United Nation statistics, people aged 80 years and above, also referred to as the “oldest old” population is likely to reach 190.44 million by 2022. This age group is more prone towards respiratory, orthopedic, cardiovascular, and neurological disorders, which will further boost the demand for care services for this demography, in turn driving the geriatric care services market share. Technological advancements assisting the geriatric population who live independently is another factor boosting the industry size. Robotic technology and nurse call equipment are examples of such technological developments. As far as the geographical landscape is concerned, the United States is one such region that is expected to come as one of the lucrative grounds for the development of the geriatric care services market. As per a report by Global Market Insights, Inc., the U.S. geriatric care services market is anticipated to record a modest CAGR of 7.6% over 2018-2024. This growth is primarily driven by the rise in the elderly populace vulnerable to chronic diseases, in tandem with the upsurge in technological advancements that are now prevalent in geriatric care services. Not to mention, the U.S. is remnant of high healthcare spending, that would lead to the country resulting accumulating the largest market share across the globe. Another factor that is likely to fuel the U.S. geriatric care services market is that the regional government is borderline fanatic about ensuring that its citizens are able to have access to excellent healthcare services at reasonable costs. Speaking of the regional spectrum, it is prudent to mention another major participant of the global geriatric care services market. Germany, a crucial player of the Europe geriatric care services industry, has been pivotal in upholding its stance in the global business space. In 2017, Germany apparently emerged as the dominant player in the Europe geriatric care services market, with a valuation of around USD 73,809.2 million. The region is projected to accrue substantial returns by the end of 2024, driven by the rising demand for cost-saving insurance plans charted out for the elderly populace in the nation. That said, the country also boasts of extensive healthcare expenditure that has led to an upsurge in reimbursement policies for the elderly, further propelling the Germany care service market. The geriatric care services industry is highly fragmented and fairly competitive. The business space is shared by the biggies as well as the new entrants. Price and quality of service provided by these players will be the major factor to sustain competition. The coming years will witness interesting developments like strategic collaborations and mergers & acquisitions in this industry that would help catapult the geriatric care services market share higher. Incidentally, the competitive spectrum of this industry comprises Senior Care Centers of America, Brookdale Senior Living, Kindred Healthcare and Genesis Healthcare Corp. This entry was posted in Healthcare & Medical Devices and tagged Adult Day Care, Elderly Care, Geriatric Care Services Market Analysis, Geriatric Care Services Market Future, Geriatric Care Services Market Share, Geriatric Care Services Market Size, Geriatric Home Care, Geriatric Nursing, Geriatric Nursing Care, Global Geriatric Care Services Market, Global Geriatric Care Services Market Analysis, Home Care, Institutional Care, Nurse Call Equipment.